We're not frequent drivers in general, since we can walk, bike, or bus most of the time, but our Modo bill tends to be a bit higher in December. It's awesome to have the option to drive when it's cold outside, or the side roads & bike routes we prefer are too slippery. We also tend to visit family in other municipalities more often during the hoidays, often toting parcels or food. 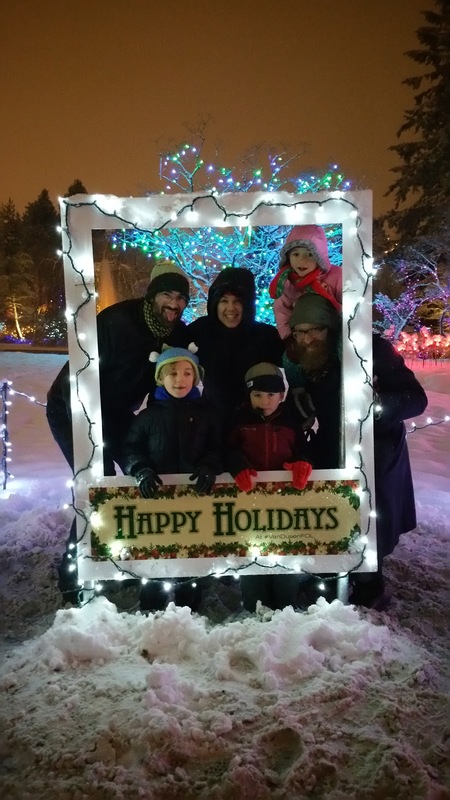 This year we've made an effort to invite friends along on our holiday outings, like going to the Vancouver Christmas Market, or visiting VanDusen Festival of Lights. 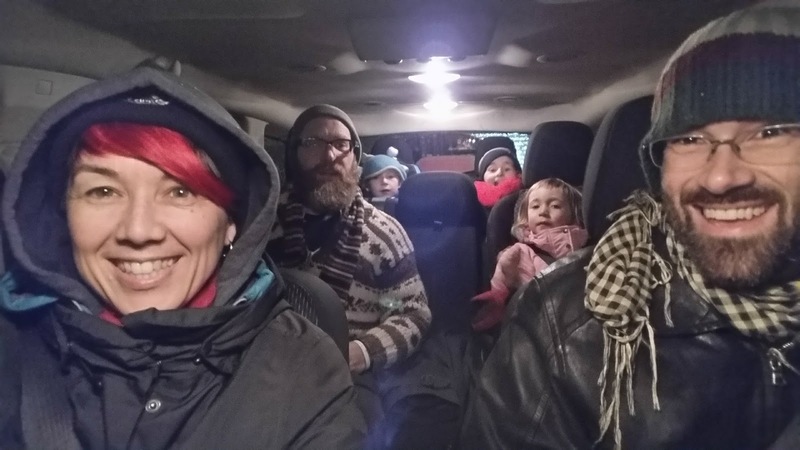 It's fun to be able to pile into one vehicle & of course greener to take just one vehicle. Much easier to find parking for a single car instead of two. Not to mention the rock star parking pass that all Modo vehicles get, to be used in pretty much any permit zones. Many of our friends are Modo members too, so it's really easy to coordinate outings. This weekend, I reserved a seven-seater & added our friend J's member number to the booking, so he could drive or pick up the car. J & his son grabbed the vehicle in their neighbourhood, then headed west to pick us up on the way to VanDusen for the Festival of Lights. Linny had fun hanging out with his friend in their boosters in the back row of the SUV, while Bronte sang her own versions of "Jingle Bells" from the middle row. This is one of my favourite things about Modo--having access to whatever kind of vehicle I need, without having to own it. We normally drive the smaller cars in the Modo fleet--Honda Fit, Mazda 2, Toyota Yaris--since they're so easy to drive & park. But when we've gone camping with another family of four, we could use an eight-seater minivan, big enough to hold all of us & our gear. Or when I bought a backyard play structure on Craigslist, I took a truck. When my friend N picked up a toddler bed we were getting rid of this weekend, he brought a little cargo van. If you're interested in reading more about why we love Modo, I wrote a list of ten reasons we love carsharing here. Are you a Modo member? Which vehicles do you typically drive? Have you tried out their vans or trucks?